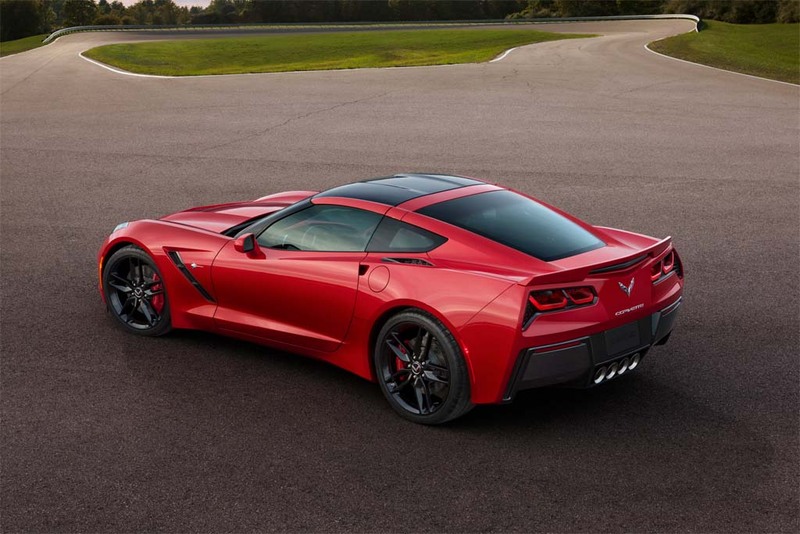 The 2014 Chevrolet Corvette by the numbers. 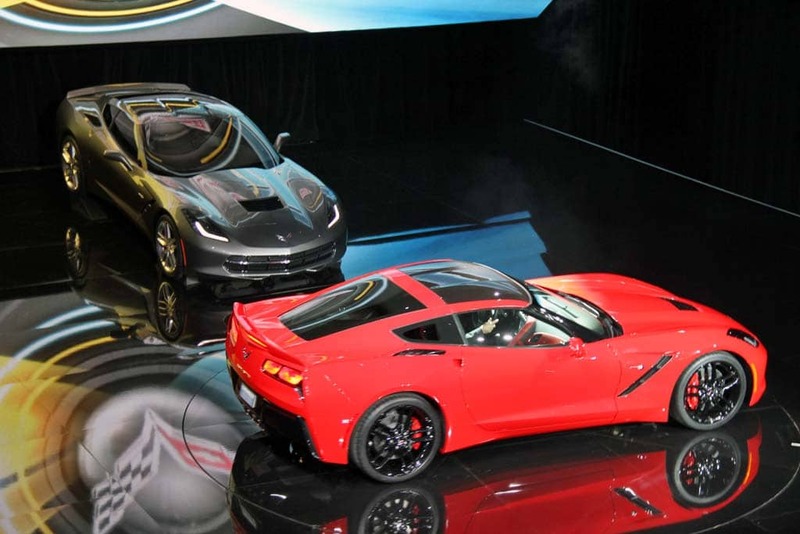 The C7, shown here at Sunday night's unveiling, will be the fastest and most powerful "base" Corvette ever. You can forgive the first Corvette. When it rolled out almost exactly 60 years ago, it was a stylish break from the heavy metal most U.S. manufacturers were producing at the time. But despite its striking looks it was a pretty primitive product, with a solid rear axle and a woefully under-powered straight-6 under the hood. It didn’t take Chevrolet long to figure out what it had to work with, and over the decades, with each successive generation, the Corvette got bigger engines and more and more power. Yet there’s a big difference between a muscle car and a sports car, and the divide between the Chevy 2-seater and European competitors like Porsche and Ferrari has only grown larger over the years. The outgoing ‘Vette, which has been in production since 2005, was perhaps the first in generations to suggest that Corvette could really produce a world-class sports car. But at least on paper, the new C7 suggests that Chevy may really be ready to deliver a 2-seater that the competition should be worried about. Here’s a quick look at some of the 2014 Chevrolet Corvette’s basics. A reconfigurable display, a track-ready wheel. Officially, the new model is the result of a 3.5-year development program. But the project was repeatedly delayed as General Motors slipped into bankruptcy. Ironically, suggests Corvette Chief Engineer Taedge Juechter, that may have been a good thing because it allowed the engineering team to access improved technology and the styling team to push through what they felt was a better design than originally approved. 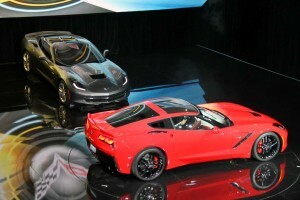 The new model is roughly the same size as the outgoing ‘Vette – with approximately the same footprint as a Porsche 911. The numbers: 176.9 inches in length, 73.7 inches in width and 48.8 inches high. The wheelbase measures 106.7 inches. There’s an all-new hydroformed aluminum frame that shaves significant mass while delivering the stiffest Corvette chassis ever, about 60% over the current C6 model. Even if you were to shave the roof off, it’s 20% stiffer than the current C6, notes Juechter. And, yes, they know that because the platform was designed from the get-go to maximize the performance of an upcoming Corvette convertible. The new C7 makes the most extensive use of carbon fiber composites of any GM product to date, including the roof, a move that helps further lower the sports car’s center of gravity. 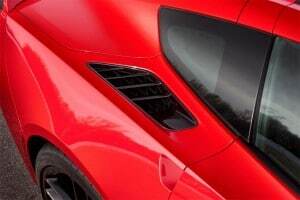 Details like these rear louvers are for go, not just for show, Chevy engineers emphasize. Much of the effort by the design team focused on aerodynamic improvements. The old car’s 0.34 coefficient of drag “just wouldn’t have been acceptable,” Juechter asserts, either for maximizing performance or fuel economy. Like many a modern muscle car, developers had to maximize both. That meant, among other things, developing an all-new powertrain, dubbed the LT1. While Chevy initially considered the idea of a downsized V-6 using turbocharging or supercharging, it eventually became apparent that a modern V-8 could actually do a better job achieving both goals, the 6.2-liter V-8 adopting such niceties as displacement-on-demand, Direct Injection and variable valve timing. The numbers haven’t been finalized, but expect something on the order of 450 horsepower, 450 lb-ft of torque and 0 to 60 times of under 4.0 seconds – which Juechter notes is better than the current Corvette Z06. The C7 will offer a choice of a 7-speed manual or 6-speed automatic. A dual-clutch gearbox was considered but GM couldn’t find one capable of handling the LT1 engine’s massive torque. Looking ahead? Stay tuned, says Juechter. Both gearboxes now offer engine rev matching, incidentally, and the exhaust system can be switched to provide a much deeper note – all the more useful for scaring the kid in the pony car next to you when the light is about to change. 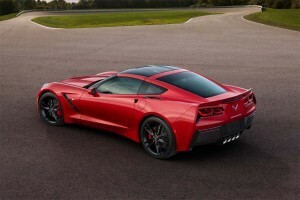 The 2014 Chevrolet Corvette will be the first badged a Stingray since 1967. Meanwhile, the target is at least 1.0 G of cornering. Helping keep you pointed and locked to the pavement is the latest version of the magnetic ride control suspension. The system responds in milliseconds to driver input and road conditions by using magnetic forces to continually vary the viscosity of the suspension fluid. To further improve traction, the Z51 sport package offers an electronic limited-slip differential. 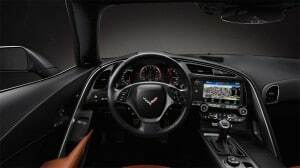 As much as the body has changed on the C7, Juechter believes, “The interior is probably the single most upgraded part of the car.” No surprise considering critics and owners almost universally lambasted the old cockpit. This “high-stress working environment” now features a number of high-tech touches designed to improve the driving experience, such as the 8-inch reconfigurable instrument panel and the second LCD display for infotainment and other vehicle controls. The latter display, incidentally, is being billed as the brightest of any vehicle on the road. For the first time, the new C7 will offer a choice of a standard or high-performance sport seat. And there’s a new steering wheel, just 360 mm in diameter, all but lifted off the current Corvette racer. It is stiffer and better connects with the tighter steering package on the new C7. The cockpit now features a 5-position driving selector that can be tuned to inclement weather, eco, town, sport or track modes. Each of those adjusts such dynamic inputs as throttle tip-in shifting, suspension, braking and stability control. Speaking of brakes, the new Corvette’s discs have 35% more swept area and Chevy claims stopping distance has been reduced by 11%. Production is set to begin mid-year. Pricing, while not announced yet, is promised to be close to that of the outgoing C6 Corvette. This entry was posted on Sunday, January 13th, 2013 at and is filed under Automobiles. You can follow any responses to this entry through the RSS 2.0 feed. Both comments and pings are currently closed.